There's no better way to get an overview of L.A. than from OUE Skyspace, located on the 70th floor of the U.S. Bank Tower. There's an observation deck that goes essentially all around the building, and you can even savor a cocktail at the Skyspace Bar while you enjoy the stunning view. Interactive exhibits showcase the city's history as a mecca of the arts and sports - this building itself has been featured conspicuously in a number of Hollywood films, including being destroyed by aliens in Independence Day. 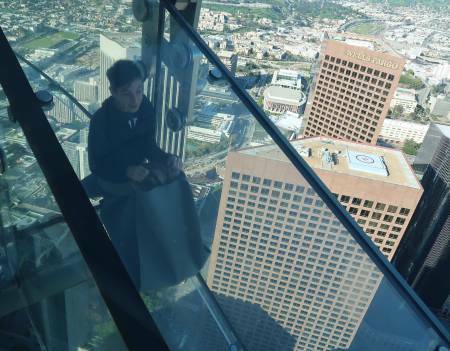 But the piece de resistance is the Skyslide, a 45-foot glass slide that takes you outside the building, sliding hundreds of feet above the city from one floor to another. Where else can you do that? Open every day 10 to 10, with the last ticket sold at 9 p.m. Bear in mind that this is downtown L.A., so low-cost parking can be a challenge.